Always wanted to learn how to scuba dive but wanted to start slow? Well, DIVEIndia will teach you in Bangalore, that too in the comfort of a swimming pool. Then, the oceans are your oyster! For those of you who just about know how to swim, or are intimated by the vast sea or ocean, but are really keen on exploring the underwater world, worry not! Thanks to DIVEIndia, you can learn how to scuba dive in Bangalore, in a swimming pool (currently the St Joseph’s Indian High School pool, on Vittal Mallya Road) and then hit the seas for some serious diving. It’s also great so you don’t waste two days of your holiday at an exotic location learning this skill. And let’s not forget the moolah that you’ll spend (that also likely to be in foreign currency!) at the aforementioned exotic location for diving training. 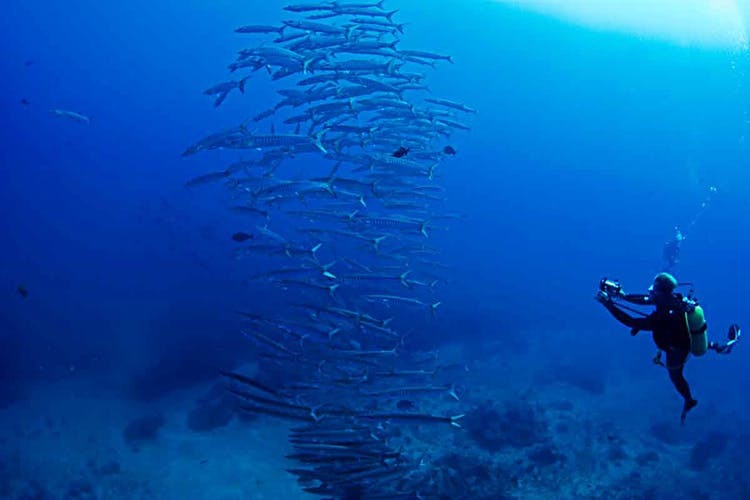 Well known as a scuba diving training centre in the Andaman Islands, DIVEIndia will kit you out with all the equipment you need to kickstart your passion for diving. Offering PADI and SSI scuba diver programs for Open Water Dives, Rescue Divers and even speciality courses if you’re already a diving pro, first pick the level you’re at. First timer? The Open Water course is the certification course required to become a trained diver. And it takes about two days, but if it takes longer, then they are super patient. If you’re a weak swimmer, this is a great way to gain confidence in the water, without being afraid of waves. You’ll possibly get so addicted to the water by the end of your certification, you’ll be booking flights to islands and beach getaways on your way home! We also love that they have a Try Scuba session in Bangalore. Got a fraidy cat friend who’s planning to sit on the beach in the Andamans? Well, sign them up slyly, and you can rest assured they’ll be diving alongside you! It’s the ideal ‘dive’ to get acquainted with the sport and water. How can anyone not like to be weightless underwater, swimming with beautiful fish and exploring the caves, coves and corals? Sign-up already! Already know your way around under the sea? Then, there are refresher courses if you haven’t dived in a while. And then there are the professional ones that’ll see you train to be a rescue diver, dive master and even instructor.